What Areas Does Dave The Window Washer Serve? Dave the Window Washer is based in Los Angeles, CA and we service all the Los Angeles and most San Fernando Valley areas. From the South Bay to the West Side to Hollywood Hills to Calabasas and all in between. To confirm we service your area please contact us via our website, email, or call our office directly. Houses close to the Beach should get the exteriors of their windows cleaned at least once every 2 months to avoid build up of sea salts which eventually will turn into hard water stains. Removing hard water stains is a time consuming and expensive procedure. Houses which are inland should get their windows cleaned once a quarter as they are exposed to some of the elements similar to beach houses but more so in terms of the grim from the atmosphere especially with LA traffic. Many people complain about the hazy/ greasy film on windows which is a direct result of the pollutants released in the air by cars and trucks. How Often Should I Pressure Wash My Home’s Walls? Pressure washing gets deep into the pours of your stucco or exterior surface material and releases all the hidden dirt thus preventing unsightly cracks that build up if neglected over time and increases the longevity and beauty of your home or building. Once a year, depending on your location is a good routine. Yes, Dave the Window Washer, works on Saturdays from 8-3pm. Sundays we are closed but should you have a special request or event you can call our office to inquire about accommodating these requests. We recommend that first time clients be present as we will do a walk though before we start working to inspect all windows in case of any pre-existing scratches or broken windows. After the first visit, we can service your exterior windows without the client’s presence as long as any pets are properly contained. If interior access is needed, clients will need to make the necessary access arrangements prior to our arrival. We understand emergency situations can occur, but we hope you contact us as soon as possible in case of a cancellation so we can offer the time slot to another client. In case it occurs afterhours please call our office and leave a message on our answering service as we check our this before sending our crew out. Does Dave The Window Washer Offer A Rain Guarantee? This is one guarantee that no one can offer, as you are trying to compete with Mother nature, but keeping up with Dave’s standards, he will be glad to come and touch up your windows within 3 days of the service date if your windows get affected by rain. What Is Included In The Window Cleaning Service? The basic window cleaning service includes cleaning the windows (interior/exterior), dry brushing or wet washing screens per request, and window tracks and sills. What Are Your Business Hours Of Operation? Dave the Window Washers business hours are Monday-Friday 9-5pm and Saturday 8-3. Nevertheless, while at our job sites our crew will stay as long as daylight and weather permits to complete the job. Yes, we are fully insured and bonded. We have both Worker’s Compensation and General Liability coverage. You can request a copy of these by contacting our office. What Should I Do Beforehand To Prepare For My Window Cleaning Appointment? If you’re having your interior windows cleaned please make sure to remove all items from the window sills as well as move any heavy furniture that may be in the way. Curtains do not need to be removed unless they cannot be moved or tied away easily to allow our crew to access your window. If you are having your exterior windows cleaned, gutters or wall pressure washed please make sure to shut all doors and windows completely so that no water gets inside the home. For free estimates & appointments call Dave today! 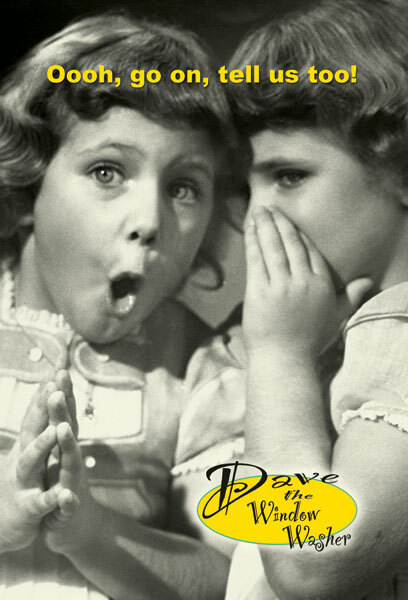 From the beginning, Dave recognized the importance of providing a reliable service to his clientele. He knows you make special arrangements to have him come in and will be there on time, everytime! © 2014 Dave The Window Washer. All rights reserved.